Pliss try to attend. And bring friends. More the heppier. yes….my best! wud have gone for sure, but i’m in b’lore. 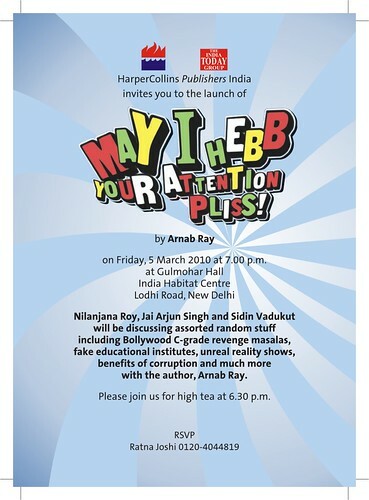 I have ordered your book, too bad you are not coming to launch it in Bangalore else would be present! How faithful a reader am I eh? All the best!! Pls pls arrange a video shoot and upload in youtube. I am sure it will be really interesting conversation! Looks like this will be a great panel discussion. Perhaps it is my lack of understanding of the English language, but what is “high tea”? will definitely try n make it there. Jab Angrez log high hoke tea peete hai to use “high tea” kahete hain. Just booked mine through Flipkart. Can’t wait to lay my hands on to it. Good luck for the launch. I am ordering it today through Flipcart. How soon do you think i will be able to lay my hands on it? Is it in stores already? Yeh angrez log high hoke tea kyun peete hain? Aargh… I’m getting too predictable. Need to watch Akhri Badla, Daanav, Jaani Dushman, or something of that class again. Say a hi to Jai, will you? Tell him I still love his eyes and his acid tongue. Wish I could come! I am sure it will be a nice event! Shipping to US costs much more than the book. No there isnt. Short of buying in India and getting it shipped yourself. All the best GB !…. Are u sure there wont be snipers at the place hired by Mithunda nd Co…. how many kinds of cakes and sandwiches? was the tea oolong, darjeeling or earl grey? in bkp, high tea means luchi-mangsho, tea being highly optional. Which URL did you try? Flipkart? There are several book store links. Do tell me which link did you use? Hi GB, Is anyone going to review the book? Probably you can ask some of the other popular bloggers to do so. Genuine review will definitely help the sale of the book. If the book is good it will definitely sell. I am sure a few people will review the book. Since one should always expect that to be done to them that they do to unto others……. whats is this all about? by when will i get hold of a pirated version on the footpath? Yes it was Flipkart one. Can you tell me from which book store I can buy? have already ordered the book but will still try to come to be a part of the panel discussions (as a listener)! all the best ! really wanted to go for the 19th march launch @kolkata, but wont be able 2 make it. will be buying the book though. Try Infibeam. Tell me how it goes. So many people want you in Bangalore !!! Wrong place to ask for this … but really looking forward to a post on what Arundhati Ray had to say at a public meeting about the Maoists. Will the book be available in NewYork or any US stores? hi GB, good event at the IHC yesterday. congrats. thanks for signing my copy. just started reading, will give you some feedback soon! i had a few questions i wanted to ask you, but time did not permit. 1) whats your relationship with Alok Nath? 2) how did you manage the interview with FIP? 2.2) who is FIP? great to see you family at the event too, see you later. Rohan, Indiaplaza and Infibeam ships to US. Nikhil, My relationship with Alok Nath is Ganga se punya. I managed the interview with FIP through Indibloggies. And no I cannot say who FIP is. Too bad I left Delhi for foreign shores a few months back. I always wanted a lock of your hair or body fluid sample for my superhuman breeding project. Already nicked Dev Anand’s false teeth, scooped a bit of Himmesh’s primordial nasal mucous from a microphone, pinto of Payal Rohatgi’s ectoplasm from an underground Mumbai silicon refill center and trace amounts of Mithun-da’s triple helix DNA from the mangled corpse of Rami Reddy….. but thou are the genetic glue that would bind them all. Eastern seaboard, here I come. PS: Getting your book from Indiaplaza soon! Is there gonna be a webcast (or youtube) of some sort of these events online for the benefit of those of us who are not in India? All the best. Tomar boi birat shafolyo pak. yeh toh hona hi tha !